I send a big Thank You to the readers who shared comments on The Blahs post last week. I started work on a couple of box cars the next day. I also broke out some stored equipment and ran a coal train on the Salt Lake Route club layout in nearby Nolensville on Monday evening. The lead image shows the coal train en route from Ogden to Los Angeles. A few Accurail 36-foot box cars arrived recently. The underframes assembled quickly and detail upgrades are being added to the car bodies. I prefer to work from the top down on these models so the corner grabs on the roof laterals were the first upgrade. Adding a retainer and the associated air line are next. End supports for the running board and the brake step will follow. After the brake staff is installed, uncoupling levers will be added. These upgrades will be featured in an upcoming blog post. 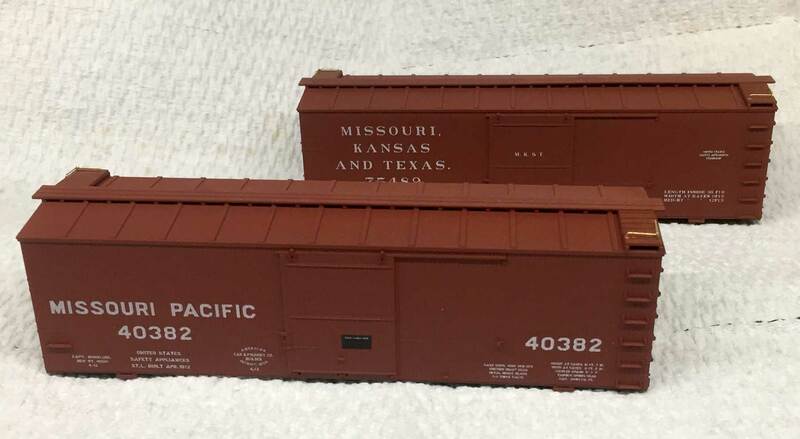 While moving, I discovered a few hopper cars that were started a year ago. The free-standing grab irons and hand holds had been removed and the holes for new hardware had been drilled. The upgrades are similar to those posted here a few years ago. I started on this Western Maryland model as I have a prototype image on the computer for a very similar car. 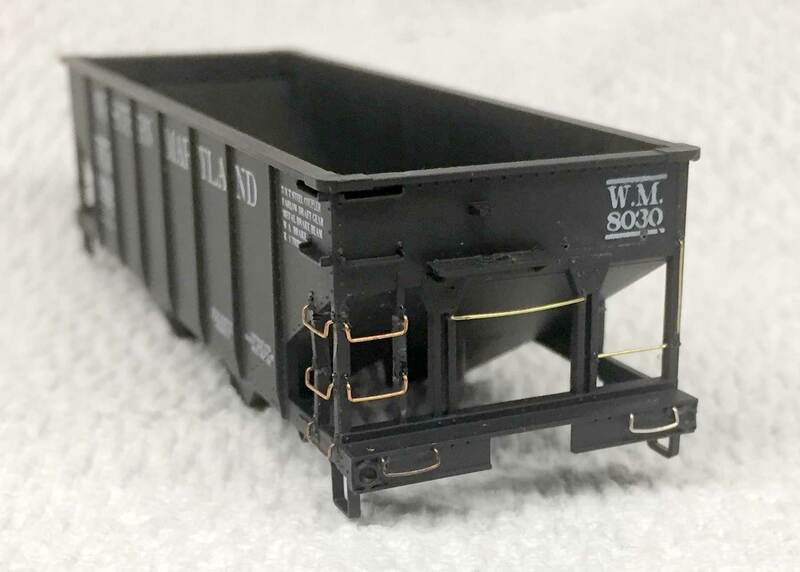 The models are made by Bowser and follow the Pennsylvania Railroad GLa coal hopper design. The WM cars were similar but a few inches taller. I’m not going to try fixing the height of the car sides but I can add appropriate details. I have three other hoppers ready for details; Pennsy, Union, and Buffalo, Rochester & Pittsburgh. My prototype images for those cars are still packed away so they will wait. The cars are looking good. My grandpa told me that while loading the coarse sized coal, mine workers would stack some lumps along the top edges of the cars like sideboards on a dump truck and load a bit more in the middle. Dad heard about some guys stole a load of coal out of a hopper car, then cut up the car and sold it for scrap. Years later, my brother-in-law told me the same story. I think this happened near Dilles Bottom, Ohio. Keep working on that coal drag, but don’t cut any of the cars up for scrap. Eric, good to see you’re pushing past the blahs. Im also enjoying seeing your progress on the acurail boxcars.